In the ideal world, you would choose Flash or Storyline based on the needs of your specific eLearning project. But because each tool has many features to consider, knowing which eLearning authoring tool is right for your project can be a challenge.We’re happy to share our knowledge and help you make an informed decision, based on our extensive use and expertise using both eLearning tools. We have created both an infographic (for an at-a-glance comparison) and a list of 9 questions to consider along with our expert recommendations. What would you like to achieve with your eLearning course?Let’s go back to the vehicle analogy. What you’re going to do with the vehicle (commute, drive the soccer team around, haul your boat to the lake, etc.) greatly impacts the selection you make, right? Similarly, what you’re going to do with the eLearning course (simulations, games, lectures, videos, etc.) impacts which eLearning authoring tool you should choose. Think about your plans for your eLearning course now and, as you walk through the other questions, your choice will start to come to light. Do you want to create game-based learning (gamification), or have complex eLearning animations and interactivity?If you’re looking to develop an eLearning game or a simulation, Flash is your best bet: it’s a proven gaming technology. You can also use Storyline to create gaming functionality, but only within its significant limitations.It's the same deal with custom eLearning animation and interactivity: the activities and knowledge checks within Storyline provide you with a vast range of standard and custom interactions, but Storyline is not on par with Flash’s capabilities to develop custom eLearning interactions, activities, and knowledge checks.For example, when publishing a course in Flash that uses an avatar, the avatars are often lip-synced along to the narration with arm and lip movement; this is pretty straightforward. In Storyline, however, a workaround is needed, such as lip-syncing avatars by compiling the animations as video. Do you plan to do some custom programming or need to include a data-driven application in your eLearning course?Flash, by far and away, has the most programming potential. Think of it as a kitchen. With Flash, you have unlimited ingredients and every kitchen appliance imaginable to create your dream dish. But, as we’ll explain below, you need an experienced programmer to make your vision appear at the table. With Storyline, you are limited to the features that already exist within the eLearning authoring tool.Flash is also the tool to use for data-driven applications; Storyline is purely an eLearning and mLearning (mobile learning) authoring tool. Forget lots of custom programming for a minute. Do you just want to have custom menus and navigation buttons?You or a vendor-partner can author standard and custom eLearning course maps in both environments, but Flash has far fewer limitations. Will your eLearning course have branching scenarios?Branching is one of Storyline’s strengths and one of its strongest native features. Branching in Flash is equally possible, but the more complex the branching becomes, the more difficult it is to implement and maintain in this eLearning authoring tool. Who will develop the eLearning course, and who will maintain it?Now that you’ve given some thought to what you will include in your eLearning course, and how high-end it will be, let’s consider who will develop it. Do you have an experienced Flash programmer (or programming team) at your disposal, either in-house or outsourced, or is your developer more capable of building eLearning courses using out-of-the-box eLearning authoring tools? If your resources are the latter, Storyline is your clear choice. And in this case, you might need to adjust your vision to match the Storyline’s capabilities.Assuming you do have that programming team in your back pocket, you still need to give some thought to how often your eLearning course will be updated and who will make those updates. Just like with your car purchase, you might need some maintenance down the road. Some vendors, like SweetRush, have built their own eLearning authoring platforms to make it easier to update Flash eLearning courses, which might otherwise need an experienced programmer. However, if you’ve got an eLearning course that’s updated frequently and an in-house team that is comfortable with making updates in out-of-the-box eLearning authoring tools, your best bet for efficiency and cost savings is likely Articulate Storyline. Do you need to distribute your eLearning course across multiple platforms: computers, tablets, etc. ?You have a clear choice in this case: Storyline is a great tool if you need to distribute the same eLearning course across multiple platforms. Storyline files can be published in versions friendly to PCs, as well as to iOS (Apple) tablets. Flash, however, can be viewed only on PCs. Now, when it comes to mobile learning, Storyline’s HTML5 output is far from perfect, but it is possible and is widely used. Flash does not work on iOS mobile devices. Do you want to include a glossary in your eLearning course? How about resources and references?Both Storyline and Flash have glossary capabilities, but Storyline does not support an interactive glossary with content links.Both eLearning authoring tools offer the ability to include resources and references, though Storyline does offer fewer options and opportunities for modification. Are you concerned about which tool allows for better graphic design? What about flexibility from a user interface standpoint?Both eLearning authoring tools are an excellent stage for the designers’ creativity.Now, Flash is always going to be the eLearning authoring tool that gives you the most flexibility, whether it’s the user interface, animations, or other features. In Storyline, there are significant limitations to the user interface and learning template. In many eLearning courses, this does not limit the effectiveness of the learning. In other courses, it may. There you have it! 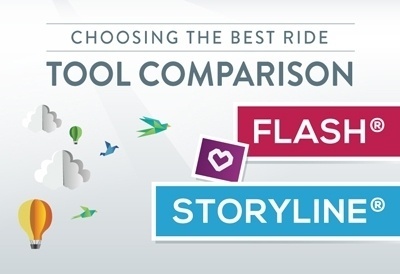 With this Flash and Articulate Storyline comparison, you should have a good idea of which eLearning authoring tool will be the best fit for your eLearning course. Now, get those keys and take her for a spin!Interested to learn more about eLearning technology and authoring tools in corporate training? Check out this interactive infographic from SweetRush: Choose Your Weapon: Off-the-Shelf eLearning Authoring Tools vs. Custom eLearning Development. This post was co-authored with SweetRush's Director of Engineering, Misha Milshtein. Misha helps support clients with innovative ideas for eLearning and mLearning that bring their visions to life!